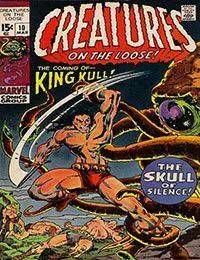 In the time before the oceans drank Atlantis and the gleaming cities... in the legend-laden days before the dawning of the Hyborian Age... the man called Kull rides proudly at the head of his hand-picked guards-men. But beware, monarch of mighty Valusia... for ahead lies terror! Ahead waits stark, unfathomable fear! Ahead lurks... The Skull of Silence!